Review: I have this desktop for about 2 weeks now and it performs flawlessly. It did not require any setup in the beginning, I have entered my name and it was ready to work. Very impressed with the software included. Genuine Windows 7 with sticker, Open Office (free), Avast antivirus (free), few game demos and that basically it. Don’t think I want to say it’s not enough - it’s all I need and no garbage that you have to clean up on every new computer. Seems like Centaurus decided not to jump on that junk wagon and I’m happy. Saved a lot of time. Also a nice surprise was that they included both original Windows DVD and 3 backup DVD, I checked them - seems to be pretty easy to restore in case of failure. Computer itself works as advertised, I have tried a few game demos installed there, Crysis seems to be working without stuttering on Highest settings. No complains so far. Review: Computer was delivered faster than expected and started up without issues. What I saw right away is the speed with which Windows loaded, it took it about 15 sec to load, that is WOW. When I have checked CPU-Z to see what’s with the processor and everything else I was shocked - my CPU was overclocked at 4Ghz flat! Memory worked 50Mhz above reference as well. I don’t know any other company that would do something like this and still provide warranty on it. 4Ghz is extreme, with Hyper-Threading I don’t need any quad cores. I can play all my games maxed out with 1920x1080 resolution and I think I would be even able to go to 2500+ resolutions if I get a new monitor. Despite high overclock my computer still runs really cool. I have upgraded to Cooler Master Hyper 212 cooler (told to be one of the bes) and in gaming I never see my processor going above 50C, while 70+ considered safe on i3. 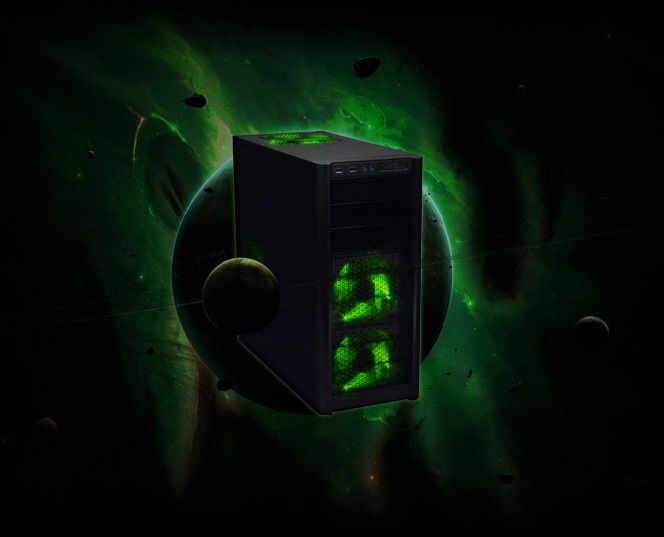 I have also got Antec 300 case and upgraded fans to green LED - just like on the picture - my PC looks awesome. None of my friends have anything like that. I don’t think I will need any upgrades in the nearest future. Single ATI 5870 can handle everything I throw at it. I am very happy with this computer. I did run all stability and gaming tests I know including 3Dmark06 and I have nver experienced any problems, machine is fast and responsive under any circumstances. Love overclock! Review: A few years ago I already have purchased Centaurus computer. Back then it was pretty good AMD machine - and it still runs but I decided to give it to my kids and get something new for myself. I can comment on a customer service - it’s perfect! I did shoot Centaurus an e-mail to get some help with new configuration. They offered me this model and a few upgrades, also they gave me 5% discount just for returning back to them. They responded every time within an hour or two after sending an e-mail. Well, computer arrived safely and really nicely packed. It came in 2 boxes with a bunch of filling stuff, it was all over the place. Inside the case I also found protective pillow, nicely done, nothing can happen to the computer packed like that. And FedEx service is better than any other. 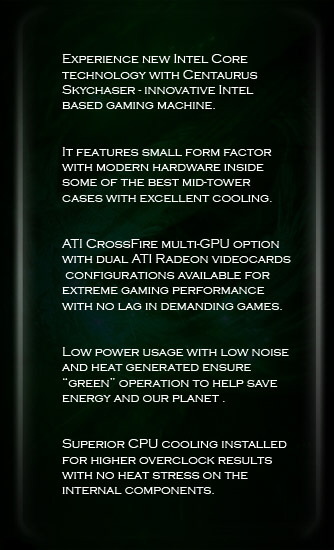 Love Centaurus, they did magic again, Hardware is top-brand as always, CPU came overclocked pretty high. I had no troubles with it so far. Games seem to run effortlessly. Though I mostly run WOW it’s good to see constant 60+ FPS in all zones. Thank you Centaurus!